Troncones, known as Playa Troncones or Troncones Beach offers miles of sandy beaches stretching along the Pacific coast set against palm trees and gorgeous mountain views. The Troncones area is known for surfing and sport fishing, but you don't have to enjoy water sports to find something to do here. Walk along the beach at sunset, go for a horseback ride, release newly hatched sea turtles, check out the tidepools, or just lounge in a hammock under a palapa with a cool drink and a good book. There is something for everyone in Troncones. 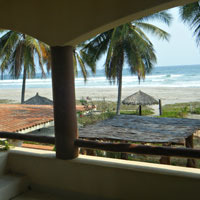 Troncones Vacation Rentals offers a complete guide to vacation home rentals in the Troncones area, often less expensive for a large group of people vacationing in Ixtapa or Zihuatanejo. 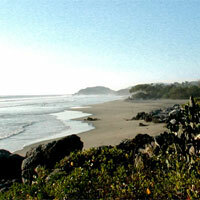 Troncones is the closest beach to San Miguel de Allende, it is an easy 5 1/2 to 6 hour drive on toll roads. Troncones is also only a few hours from the colonial towns Patzcuaro, Uruapan and Morelia. This beachfront 2 Bedroom each duplex has two identical units which can be rented separately or together. The master bedrooms open up to private patios with soaking tubs - the perfect spot for watching the sunset over the Pacific. 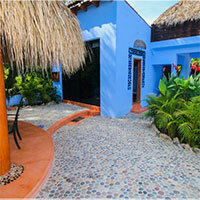 This private elegant hideaway boasts large open rooms and a breathtaking palapa living space. Gaze out at the Pacific Ocean while taking a dip in the pool. Enjoy the great breezes that grace the property while swinging in a hammock, drinking fresh coconut milk. Casa de Oro is located at the end of the idyllic Troncones Beach with 2 grand ocean-view master suites and two optional garden bungalows. The private pool, secluded tranquil location, large open-open air living room, gourmet kitchen, dining room and rooftop bar make Casa de Oro the ideal villa vacation rental. Playa Buenavista is a hidden gem just 3 miles south of Troncones with very few inhabitants but miles of beach lined with coconut palms and great waves for swimming or body surfing. La Saladita, north of Troncones, is a surfer's dream known for its machine-like-3-minute left break. The resort town of Ixtapa was just listed as one of Trip Advisor's top ten family destinations in the world. 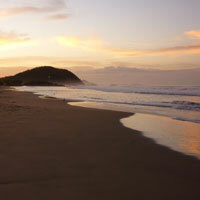 And Zihuatanejo provides visitors with numerous restaurants, snorkeling, boating, and a sprawling mercado. 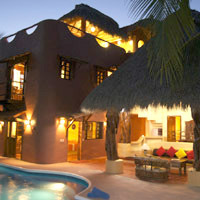 "Troncones Vacation Rentals provides listings for homes for rent in Troncones and its surrounding areas. These listings include a wide variety of houses and bungalows. Whether you are looking for a secluded romantic getaway or a large home for a family reunion or destination wedding, you are sure to find it here. Homes for rent are available by the day, week, or month." (c) 2019 Troncones Vacation Rentals. All rights reserved.